UPDATE – 4 P.M., Dec. 5. Officials with the Montague County Sheriff’s Office have confirmed the human remains found north of Bowie Tuesday morning are possible those of a male subject, but no identification or cause of death has been determined. Chief Deputy Jack Lawson said the remains were discovered by workers with Burlington Northern and Santa Fe Railway about 11 a.m. on Tuesday on the northbound side of U.S. Highway 287, two miles north of Bowie. The skeletal remains were found about 20 feet from the highway. Lawson said they believe the body has been there some time, possibly disturbed by wildlife, which prompted its discovery. The Texas Rangers and BNSF Police were notified, and the remains were sent to the Dallas County Southwestern Institute of Forensic Sciences for autopsy. Lawson said they hope to learn other possible identifiers such as age and possibly a name. 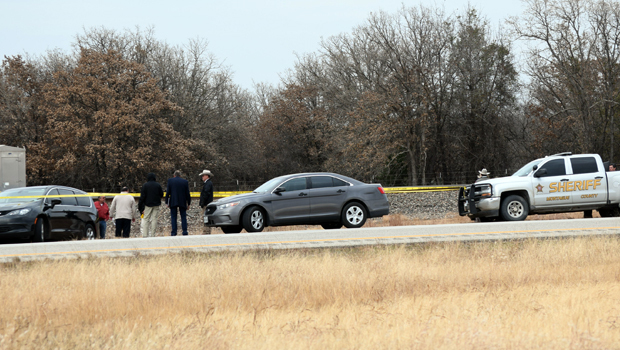 Shortly before lunch Tuesday officers with the Montague County Sheriff’s Office began investigating a possible crime scene north of Bowie on U.S. Highway 287. Sheriff Marshall Thomas said at 2 p.m. they were working a crime scene where human remains had been found between the railroad tracks and highway. He said there are no additional details at this time. The scene is located across from Lipscomb Auto. A Texas Department of Transportation flashing signs were placed in the right lane to warn of people working. Yellow crime tape also had been put up around what appeared to be the possible crime scene. I think might be the missing boy Calib Diel, from Nocona, Texas. I think it’s highly possible that it’s him. How could they say there’s no missing persons in area..the body proves there one..but anyway what about caleb?? ?